Tour the newly installed benches along the Ladybird Lake Boardwalk. You will be given an accompanying booklet as your guide and project participants will be available for questions at each of bench. Learn about the creation of the benches, from reclamation to realization! 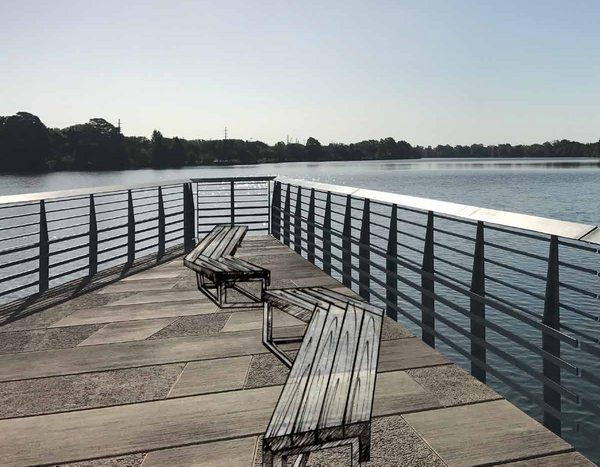 The Boardwalk Benches: Reclamation to Realization will be a self-guided tour of the newly installed benches along the Lady Bird Lake Boardwalk. The tour and accompanying Boardwalk Bench Booklet will illustrate to visitors the vision, funding, design, fabrication and installation process. It will open doors between the designers and the public to foster public design that is ecologically site-specific and positively impacts users’ mental, physical and emotional health. The booklet will present information regarding the collaborative groups involved such as The Trail Foundation, Studio Balcones, Hatch Workshop and the Urban Forest Grant. Because the benches were all created from reclaimed trees felled within Austin, this tour will open doors to sustainable city resources such as the Urban Forest Grant, which helped to fund the project. 1. Nonlinear, self-tour, where a representative from each organization is present at individual benches to answer participants’ questions as they move between the benches. 2. Linear, guided tour that follows the creative/production process with each bench representing a separate design phase. If you’ve ever been curious as to where trail amenities come from, please join us to find out! We'll have Hey Day ice coffees, Kind bars, TTF hats and koozies, color booklets.